The Elsevier Foundation Green and Sustainable Chemistry Challenge is a collaboration between the Elsevier Foundation and Elsevier’s chemistry journals. The five finalists for the 2018 edition pitched their projects during the Green and Sustainable Chemistry Conference in Berlin, after being selected from over 500 submissions by a jury of experts in the field. “We are proud to award two projects with immediate relevance for communities in developing countries,” said Professor Dr. Klaus Küemmerer, Chair of the Challenge’s scientific jury. 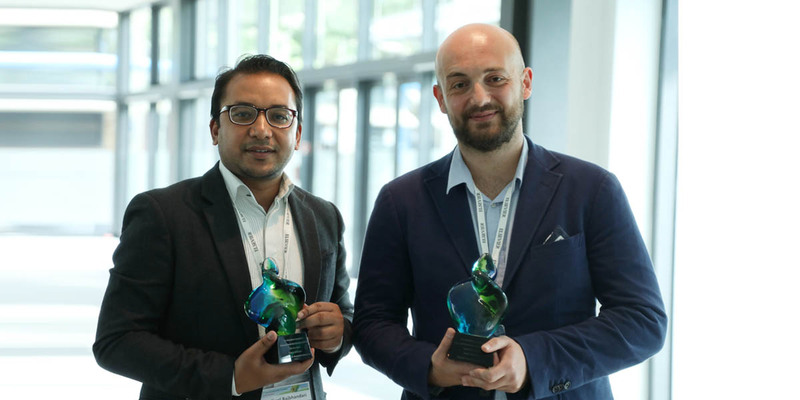 Dr. Rajbhandari, was awarded the first prize of EUR €50,000 for his project, “Guava leaves as natural preservatives for farmers of Nepal.” Due to a lack of viable non-toxic preservatives, or cold chain technologies, one-third of Nepal’s produce is spoiled before it reaches market each year. Dr. Rajbhandari’s project taps the antioxidant and antimicrobial properties of guava leaves to make a water-based, sprayable natural preservative. “Winning the Challenge is more than I could dream of. I can now scale up the project, and work with local teams to turn it into a success.” said Prajwal Rajbhandari. 2018 Elsevier Foundation Green and Sustainable Chemistry Challenge Winners, Drs. Rajbhandari and Admiano (right) (Credit: Luz Inés Baños Quintana). “Using guava leaves as a natural preservative replaces toxic chemicals and can be easily implemented at a local level involving local people; directly allowing for the safe transport of fruits to the local market without any residues being dangerous for the consumer and the farmers,” Dr. Küemmerer added. The 2018 Challenge builds off the success of previous years, which saw prizes awarded for chemistry solutions that tapped native plants’ residual waste to tackle mosquito-borne diseases through environmentally friendly insecticides, and a focus on eco-remediation of land devastated by crude oil spills in Nigeria. The second prize, worth EUR €25,000, was awarded to Dr. Alessio Adamiano, a researcher for the Italian National Research Council at the Institute of Science and Technology for Ceramic Materials. His project, “Phos-Fate: Empowering fishing communities for climate change”, demonstrated how phosphorous can be recycled in a simple, scalable way by converting fish bones into products such as fertilizers. Dr. Adamiano and his team will work with partners in Senegal and Spain to pilot this unique circular economy project. “My team will do their best to make the most out of this wonderful opportunity,” said Dr. Adamiano. “Through projects such as these, which clearly tackle key UN Sustainable Development Goals around food security, the Challenge is helping build a stronger, green and sustainable chemistry community, and will boost knowledge transfer around the globe.” said Ylann Schemm, Director of the Elsevier Foundation. Additionally, the International Sustainable Chemistry Collaborative Centre (ICS3) will support the development and implementation of a third proposal, “Biomass-plastic: Eco-friendly structural materials”, from Dr. Manuel Palencia, Universidad del Valle, Cali, Colombia, with in-kind resources. Dr. Küemmerer is Director of the Institute of Sustainable Chemistry at Leuphana University Lüeneburg and also serves as the scientific director for ISC3, The International Sustainable Chemistry Collaborative, Chair of the Green and Sustainable Chemistry Conference, and is Editor-in-Chief of Elsevier’s journals Current Opinion in Green and Sustainable Chemistry and Sustainable Chemistry and Pharmacy.